Met Éireann's weather partners in Britain are predicting a return of heatwave temperatures after the recent interlude of fresher weather. While Ireland's cooler, wetter weather of recent days is set to stretch into the weekend and next week, the UK has continued to bake. Temperatures across the Irish Sea are set to peak at 37 degrees which if reached will be a July record high in Britain. Britain's Met Office, an official forecasting partner with Met Éireann, also expects intense thunderstorms to hit Britain on Thursday and Friday as the cooler wetter weather expected to cross Ireland hits the intense heat in Britain. While this will bring a brief interlude for both countries into next week, the Met Office forecasts say indications are that the hot weather will return. In its ten day forecast the Met Office says the jet stream will return to the south of Britain and Ireland early next week bringing 'changeable weather' with rain, cloud and cooler temperatures. "The heat is only temporarily shoved out of the way by the looks of things...There are are many computer models that agree that the high pressure will return," said forecaster Aidan McGivern. The high pressure will spread from Scandanavia and over Ireland and Britain, into the Atlantic to the south and west of Ireland. "Very warm or even hot air returning by the end of next week," added the forecaster. 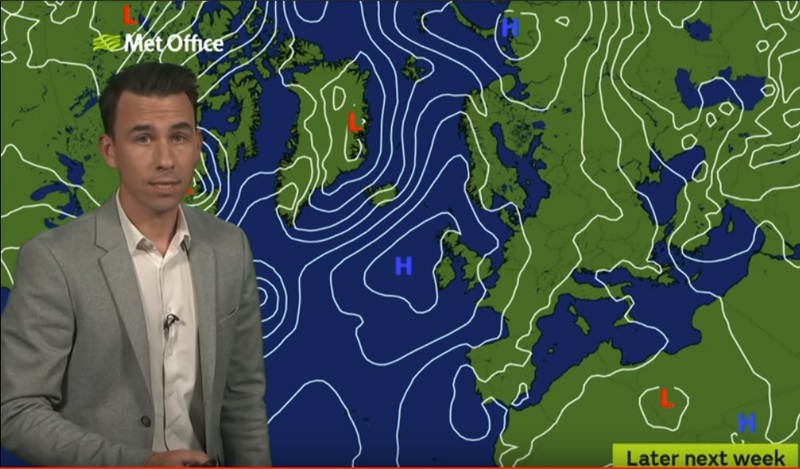 Watch the Met Office forecast with this story.